WEST LAFAYETTE, Ind. - As students return for the fall 2014 semester at Purdue University, they will notice enhancements to public safety on the West Lafayette campus that were implemented over the summer months. * As part of a pilot program, emergency beacons, door locks and desktop pop-up alert windows are being installed across campus. Emergency alert beacons are being installed in 27 large classrooms. 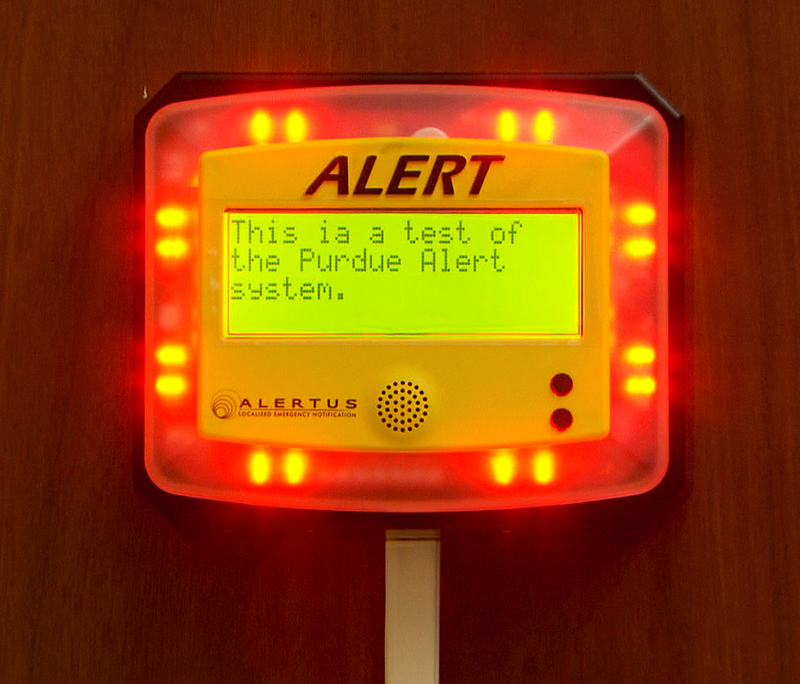 These beacons will be activated when a Purdue ALERT is issued. Students and faculty will see the beacon light up, and an alarm will sound. An emergency text message will also appear on the beacon’s screen. * Door locks are being installed in these same classrooms. These locks will be compliant with ADA requirements and fire codes. * Desktop pop-up alerts have been installed on a majority of classroom computers and on machines in a majority of university computer labs. 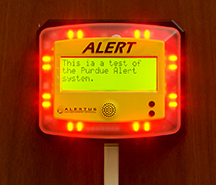 A window will pop up on a machine with a message when a Purdue ALERT is issued. The plan is to phase in more university computers in the coming months if the pilot program is successful. * The Purdue Emergency Twitter account (@purdueemergency) has been integrated with the Purdue ALERT text message system. Text messages sent to university students, faculty and staff will be simultaneously posted on Twitter. Enhancements have also been made to the Campus Safety Status webpage. Students, faculty and staff are encouraged to bookmark this page. * All-hazards awareness training sessions will continue to be available to those interested through the Emergency Preparedness Office. To date, more than 2,000 faculty, students and staff have participated in these sessions since last spring. The training seminar is now available online through the university’s WebCert program, as well as Blackboard Learn. “These enhancements to public safety will begin a data-driven process that systemically reduces risk across campus and has a clear path toward a safer campus,” said Eric Dietz, professor and director of the Purdue Homeland Security Institute. Dietz and Shelby are members of the implementation committee charged with evaluating the recommendations of the security feedback panel report and taking action. Dietz added that the action must have the support of the Purdue students, staff and faculty. Information on these enhancements is posted on the Environmental Health and Public Safety website. A letter recently distributed by the Office of the Provost provided information and suggested instructions for faculty members on the topic of safety. This letter was also published in Purdue Today, the university’s internal newsletter to faculty and staff. The Emergency Preparedness and Planning Office will be rolling out a campaign called “Get ready, get set, go” to help the campus community decide what steps need to be taken when an emergency is not near him or her specifically, nearby his or her location and inside his or her building. Students, faculty and staff are encouraged to sign up for emergency text alerts from Purdue. Faculty and staff are also advised to familiarize themselves with their Building Emergency Plan. Note to Journalists: Video of the emergency beacon and desktop pop-up alert window is available for use at: ftp://news69.uns.purdue.edu/Public/EmergencyAlerts/. To arrange interviews, please contact Liz Evans at 317-696-0745 or lizevans@purdue.edu.